All transactions are safe and secure with a reliable history in online purchasing behind each of our associates. 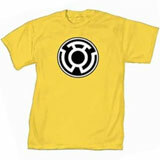 Buy the Sinestro t-shirt to own Green Lantern clothing and merchandise. This yellow Sinestro t-shirt is for people who would prefer to be the villain for a while rather than the hero. He is formerly the mentor of Hal but has since switched sides and is making himself known by creating a band of evildoers known as the Sinestro Corps. Pair it with a Green Lantern movie shirt, hoodie or hat. In addition to the Sinestro tee above, browse the Green Lantern Clothing Gallery for more apparel like men's and women's clothes, kids shirts or hoodies.